Victoria, BC – A new partnership between Cycling Canada, Cycling BC and the Canadian Sport Institute Pacific has resulted in the creation of the Cycling Talent Development Program which will begin operating on October 1, 2013, based in Victoria, BC. The partners are taking integration to the next level by developing this program directly in line with Cycling Canada’s High Performance Athlete Development Pathway. The Cycling Talent Development Program is committed to supporting the identification and development of Canadian athletes who have the qualities required to be Olympic/Paralympic champions. With the financial support of Own the Podium (OTP), Sport Canada, and the Province of BC, the partners will recruit and hire a Cycling Talent Development Program Coach – who will be a full-time employee of the Canadian Sport Institute Pacific. The Cycling Talent Development Coach will join the existing team of five Canadian Sport Institute Pacific Talent Development Coaches in the sports of rowing and swimming in Victoria, plus freestyle mogul skiing and luge in Whistler. A career posting for the Cycling Talent Development Coach is available online at csipacific.ca, and also can be seen as an attachment to this release. The focus of the programs will be to identify, target and develop athletes with Olympic/Paralympic podium potential. The program will provide athletes with the guidance, coaching and sport science support required to advance their athletic careers as they transition through the Train to Compete stage of Cycling Canada’s Long Term Athlete Development model (see www.cyclingcanada.ca/development-programs/cycling-ltads/ for more details on Cycling Canada’s Long Term Athlete Development model). The athlete selection process for the Cycling Talent Development Program will be announced in June, 2013. PreviousPrevious post:Canadian Sport Institute Pacific Offers Bursary to Team BC Coaches at Canada GamesNextNext post:Do You Think You Could Be An Olympian? Hayato has been involved with the sport for 8 seasons now, with my roots starting in Coquitlam. Growing up, he saw his brother curling, and watched him play the sport and being able to travel all across B.C. competing in various events. This got Hayato interested in curling and he decided to give it a try. He became a member of the Coquitlam Curling Club, where he was able to meet various athletes, coaches, and parents who all loved the sport. For individual training sessions to effectively contribute to the overall objectives of an annual training plan, a coach must understand the outcome of each training session and how their cumulative effects will contribute to athletic development. The Advanced Practice Planning module examines the impact of daily training sequencing and the manipulations that can affect training outcomes. Identify the factors that affect practice planning. Ensure that practice plans are consistent with the microcycles and phases of which they are part. Sequence exercises in a practice so that their order is consistent with the research on sequencing. Develop a plan for training athletic abilities over a microcycle. Develop a plan for training technical and tactical abilities over a microcycle. Develop a plan for a microcycle that helps athletes taper before a competition. The CSI Pacific PodiumCast is a collection of one-on-one interviews between our Athlete Coach Services team and a variety of high performance athletes, coaches, and support personnel. Listen to each and learn from Canada’s best as they share their wisdom and sport experience with the intention of passing on their expertise and guiding the next generation of great Canadian talent. Think you have learned enough in one of our subjects to show your expertise? Earn a Canadian Sport Institute Pacific Sport Education Certificate by completing all requirements listed! Occasionally, CSI Pacific plans individual presentations that build on one another creating a mini-series in a particular subject that allows the speaker to go deeper on the topic. Watch all four parts in our two currently offered mini-series: Mental Performance and Nutrition. The Sport Performance Speaker Series offers numerous workshops, webinars, and education events throughout the year. Where possible, presentations are recorded and repurposed for additional engagement on-demand. Here you will find more than 50 such presentations, across eight high performance disciplines, to help educate and support elite athlete development. Please fill out your name & sport. After you click "Submit", you will be provided a link to the video. In this session, athletes will start to plan out their individual competition needs, based on what a competition schedule looks like for their sport. This session will also look at situations where athletes are travelling to competition, or where there may be a lack of access to familiar foods, and how best to adapt their competition nutrition plan. Genevieve Masson works as a Sport Dietitian at Canadian Sport Institute Pacific, supporting elite athletes from a variety of sports including: freestyle skiing, ski cross, snowboarding, luge, cross-country skiing, biathlon, wrestling and softball. Gen enjoys helping the athletes perform at their best through nutrition-based interventions and research. Celina Toth began diving at the age of 12 after retiring from gymnastics. Her transition from one sport to the next occurred in only a handful of days – she quickly found herself at the pool five times a week. A national team member for the last decade, Toth won her first international medal in 2015, when she finished 3rd in the 10m at the FINA Grand Prix in Madrid. Since then, the Ontario native contributed in qualifying a second Rio 2016 Olympic berth for the country when she finished 4th in the semifinal and wrote her ticket to the final. Recently, Celina won her first International win on the FINA Grand Prix diving circuit in Germany. In this Athlete Interview, Celina opens up about her experience as an athlete in a judging sport- battling with body image, mental health issues, and seeking support from external sources as well as internal reflecting and self improvement techniques. Join Kendra and Celina as they discuss openly and honestly about some mental health difficulties associated with being a high performance athlete as well as every day life struggles with self image. Identify common injuries in their sport and develop appropriate prevention and recovery strategies to keep their athletes injury-free during training and competition. Offer valuable information and guidance on hydration, nutrition, and sleep as they relate to injury prevention. Choose skills and drills that help athletes perform appropriate warm-ups and cool-downs. Develop functional evaluations for an athlete’s return to play. Implement recovery and regeneration techniques to help an athlete maintain or return to optimal performance post-injury. Help athletes learn to manage distractions and use visualization techniques to prepare themselves technically and tactically for training and competition. Learn how to work with athletes or teams to identify performance and process goals related to their ability to focus on performance. Learn debriefing skills that can be used to help athletes assess their performance in both training and competition. Fully understand and explain the consequences of using banned substances in sport. Educate athletes about drug-testing protocols at major competitions. Encourage athletes to safeguard their sport values and take greater responsibility for their personal actions. Apply the NCCP Ethical Decision-Making Model to their coaching as it relates to keeping their sport and athletes drug-free. As coaches begin to take on more responsibility, they are expected to plan and execute tasks that go beyond the delivery of daily training and the management of the daily training environment. The Manage a Sport Program module provides coaches with the opportunity to plan and interact with program budgeting, setting staff and team expectations, arranging team travel, building athlete agreements, and reporting on athlete/team progress. This module is perfect for any club head coach, provincial team coach, aspiring team manager, or technical administrator. Manage administrative aspects of the program and oversee logistics. Manage staff’s roles and responsibilities. Manage camp and tournament finances and travel. Report on athlete progress throughout program. Be able to implement general and sport-specific training protocols and methods to effectively develop or maintain the athletic abilities necessary for their sport. Know how to apply training principles and variables to training methods that build fitness, endurance, strength, speed, and sport-specific conditioning. Be able to select and adapt testing and training protocols. *Includes two-hour online pre-workshop session. In order to achieve peak performance, an athlete’s training program needs to be periodized according to the demands of their sport as well as their individual development needs. The Performance Planning module allows coaches to reflect on the structure of a yearly plan and appropriately sequence training and development priorities so as to achieve peak performance. Perform a thorough analysis of the demands of their athletes’ sport at the elite (high performance) level. Outline a program structure based on training and competition opportunities. Identify appropriate measures for promoting athlete development within their own program. Integrate yearly training priorities into their own program. Organize and sequence training priorities and objectives on a weekly basis to optimize adaptations. Evaluate the ability of their athletes/team to perform up to their potential in competition. Promote a positive image of sport, and model it to athletes and those supporting their performance. Deliver clear messages and explanations when communicating with athletes and their supporters. Identify opportunities to interact with all athletes and use feedback to improve and correct performance and behaviour. Identify common sources of conflict in sport. Determine which individuals or groups are most likely to find themselves in situations involving conflict. Learn important skills that will help coaches prevent and solve conflict resulting from misinformation, miscommunication, or misunderstanding. Develop skills that will empower you to listen and speak effectively in conflict situations while maintaining positive relationships with athletes, parents, officials, and other coaches. By successfully completing this workshop, coaches will be fully equipped to handle virtually any ethical situation with confidence and surety. MED is one of the NCCP’s cornerstone workshops, and leaves coaches with no doubt as to what to do when the going gets tough. Analyze a challenging situation and determine if it has moral, legal, or ethical implications. Apply the NCCP Ethical Decision-Making Model to properly respond to each situation in a way that is consistent with the NCCP Code of Ethics. Harry Jones plays for the National Rugby 7’s team. He captained Canada’s team at the 2009 IRB Junior World Championship in Japan. He also competed for Canada at the Under-17 and Under-19 levels while also playing in the Canadian Rugby Championship for the BC Bears. Harry is an extremely consistent player on Canada’s Men’s Sevens Team and played in all 10 tournaments during the 2017-2018 season before competing at the Commonwealth Games. Harry and the National 7’s Rugby Team are currently training for the 2020 Tokyo Olympics’. In this Athlete Interview, Harry discusses being in a leadership position on a high performance team, the balances of being an athlete and thinking about the future after sport, and what it’s like battling with injuries during season and overcoming not only the physical aspect of being injured but the mental battle too. After you click "Submit", you will be provided a link to the mp3. Joanna (Jo) Irvine, Registered Dietitian, obtained her undergraduate degree in nutrition from the UBC and is also a graduate of the specialized Sport Nutrition program from the International Olympic Committee. Over the past several years she has been working with the Canadian Sport Institute Pacific providing nutrition support to a variety of teams including Canada Soccer, Cycling Canada, and Swimming Canada to help optimize athletes’ performance during both training and competition. Aside from her passion for work and drive to stay current with sport nutrition research, Jo enjoys being active and outdoors with her very energetic family. Since 2011, Dr Trent Stellingwerff serves as the Director of Performance Solutions / Innovation & Research at the Canadian Sport Institute Pacific (Victoria, Canada). In this role, he directs 15 different major research projects across different sport performance discipline areas, with 6 PhD to Master’s students involved. He is also the Director of Sport Science & Sports Medicine for Athletics Canada. His primary sport and research focus is via his physiology and nutrition expertise primarily to Canada’s National track and field team. Prior to this, Trent was a senior scientist in Performance Nutrition for PowerBar at the Nestle Research Center (Lausanne Switzerland). Trent has more than 80 peer-reviewed scientific publications in the areas of exercise physiology, skeletal muscle metabolism and performance nutrition and supplementation. Furthermore, he has co-authored 7 book-chapters focusing on the role that nutrition can play in supporting elite athlete performance. In 2010, Trent was a lead author and presenter for the IOC (International Olympic Committee) Consensus Meeting in Nutrition. Over the years, Trent has attended 3 Olympic Games, 4 Commonwealth Games and 5 World Championships. Riley Pickrell is a track and road cyclist based in Victoria, BC. Riley is a high school student at Claremont Secondary School as well as at the Canadian Sport School in his grade 12 year. Prior to competing in Cycling, Riley formerly competed recreationally in most seasonable sports including hockey, baseball, lacrosse, tennis, water and alpine skiing and short track speed skating. In 2011 Riley sailed with his family to New Zealand and back. After returning, Riley began competing in cycling. Over the past 4 years, Riley has competed in five age group National Championships, winning a total of 36 national medals on the road and track. This past summer Riley competed at the Tour De L’Abitibi, a Junior World Cup Stage Race and the Junior Track Cycling World Championships. At the Tour De L’Abitibi Riley Competed for team Canada winning 3 stages and 2 additional podiums. A month later at Junior Worlds, Riley finished the Scratch race in 4th. Riley shares his ideologies on school balance, the training and social benefits of the Canadian Sport School, an individual’s “happy place” and the personal gains found from selflessness training. Riley Pickrell is a track and road cyclist based in Victoria, BC. Riley is a high school student at Claremont Secondary School as well as at the Canadian Sport School in his grade 12 year. Over the past 4 years, Riley has competed in five age group National Championships, winning a total of 36 national medals on the road and track. This past summer Riley competed at the Tour De L'Abitibi, a Junior World Cup Stage Race and the Junior Track Cycling World Championships. At the Tour De L'Abitibi Riley Competed for team Canada winning 3 stages and 2 additional podiums. A month later at Junior Worlds, Riley finished the Scratch race in 4th. Riley shares his ideologies on school balance, the training and social benefits of the Canadian Sport School, an individual’s "happy place" and the personal gains found from selflessness training. One of the best ways to learn in sport is to hear the stories and lessons from the athletes that came before. Brittany Waters represented Canada over a ten year career on both the women's rugby 15's team and the 7's team, bringing home world cup silver medals in each world cup event. Listen to Brittany's anecdotes and personal points of view from an athlete that went as far as she could go in her sport. Brittany is now taking her experience as an athlete and transferring her skills into becoming a very successful coach for the University of Victoria; also hear how her experience as an athlete has helped to shape her coaching philosophies and what she looks for in her current athletes. Anastasia is passionate about storytelling, capturing moments and generously sharing her expertise with creatives and business owners as a partner, collaborator and mentor. As an entrepreneur’s daughter, she’s often felt that business was in her blood and she feels lucky to have waded through a lot of creative confusion early in her career. Anastasia credits her decision to be the photographer she wanted to be, not the photographer she thought she had to be, with defining her authentic photography style and providing so much personal and professional fulfillment. Later in her career, building a network of people with shared values and interests and being relentlessly loyal, generous and curios opened up a new passion in her for mentoring women. In 2016, she launched two new women-centered businesses. In reflecting on your profession over the last 2 years of incredible growth, the same thought kept coming back; the thought that she could link the exact path of people and moments that moved her ahead in her career and life to actual experiences or meaningful conversations. Anastasia knew she wanted to pass that on. She wanted to talk and connect, inspire and encourage. With Anastasia Creative, she helps businesses create authentic content and tell fearless stories to connect them with the people who will appreciate their work the most. Talking about branding and values with anyone who will listen, is what inspires her the most. It’s likely you know at least one person who speaks in hashtags and live posts everything from their training to meal prep. It’s less common to find people actively using social media as a tool to boost their productivity, deepen their creativity, and enhance their careers. Whether you spend all your time on social media, or avoid it altogether, you may be overlooking an effective tool to plan for success and connect with your community. This workshop is designed to give you the tools to put Instagram to work for you whether you are a pro user or just need it broken down into simple steps. We will cover everything from crafting your Instagram bio, to clarifying your visual values, and appealing to your prospective target market…. That is… after defining them. YOUR INFLUENCE WILL SOAR WHEN THE FIRST PERSON YOU INFLUENCE IS YOU. This session will focus on putting it all together when it matters … performance on demand. Mental performance strategies and concepts for tapering, travel, managing ‘threats’ to performance, and executing the competition plan will be addressed so to allow for ‘success by design’. This session will allow the athlete to refine the topics presented in the 2nd workshop (Establishing the Mental Performance Building Blocks). Establishing competition plans & objectives, combined with increasing specificity, complexity, and adversity in training will be explored in relation to helping the athlete refine their mental performance routines and abilities. This session will help the athlete identify the mental performance building blocks and create the blueprint to set the tone and course for the season to allow for ‘success by design’. Strategies around self-awareness, motivation, lifestyle management, injury & health management, focused & purposeful training, developing mental performance routines, and characteristics of excellence will be explored. This session will explore the challenges and strategies that athletes can face when moving into the off season, including reduced training loads, changes to daily routines, lack of structure & accountability, and involvement in other life / social activities. Strategies around debriefing and decision-making to maximize the benefit of the transition phase with health, wellness, and performance as part of the framework. Bruce has worked as a mental performance consultant in a variety of contexts for over 20 years. Sport, Health & Injury Rehabilitation, Education, & Business. Sport: Bruce has worked with teams and athletes ranging from Olympic / National to Provincial / Regional, and down to grass-roots local youth sport participants. Through this he has enjoyed being part of the fabric of success at all levels, and being a part of Team Canada at a variety of major events, including the Olympics, Paralympics, Commonwealth Games, Pan American Games, and numerous World Championships and other international events. With over 450 medal performances at international events by athletes he has supported, Bruce has an excellent background in helping athletes and teams excel and achieve optimal performance. Areas of focus include mental preparation routines, mental resiliency, team dynamics, injury management (mental performance perspective), performing under pressure, performance consistency, high-performance lifestyle routines, and athlete wellness. One of the best ways to learn in sport is to hear the stories and lessons from the athletes that came before. Brittany Waters represented Canada over a ten year career on both the women’s rugby 15’s team and the 7’s team, bringing home world cup silver medals in each world cup event. Join us this July 26th at 6pm to hear anecdotes and personal points of view from an athlete that went as far as she could go in her sport. Brittany is now taking her experience as an athlete and transferring her skills into becoming a very successful coach for the University of Victoria; also hear how her experience as an athlete has helped to shape her coaching philosophies and what she looks for in her current athletes. Do not miss this chance to learn from a very real experience! Brittany Waters is the head coach of the University of Victoria (UVIC) Women’s Rugby Program. Brittany recently retired from the National Senior Women’s Team this past September after a ten year career with the program. Brittany has competed in five World Cups, including the 2013 7s World Cup and 2014 XVs World Cup where Canada earned silver medals. Brittany first started playing rugby at UVIC in 2005 and played out her five years of eligibility there. She returned to UVIC in 2012 as an assistant coach while training with the centralized 7s program. In 2015 Brittany took over as head coach and has since helped lead the team in winning two CanWest Championships and a National 7s Championship. Coaching at UVIC and playing rugby at the National level simultaneously for over three years has provided Brittany with a greater understanding of the athlete/coach dynamic. This experience has provided her a unique look at both the athlete and coach perspective, and has helped her to become a better athlete and coach. With increased stress on the body comes the risk of illness and possibly injury. This session will focus on ways nutrition can help protect you and help with your recovery from injury or illness. This session will explore the challenges that athletes can face when moving into the off season, when training load is significantly reduced. Nutrition strategies addressed will include periodizing nutrition, optimizing satiety, mindful eating practices, and recognizing hunger cues. Recommendations from this session can also be used during taper periods before competition. Ashley is a Registered Dietitian and Certified Specialists in Sport Dietetics, with a degree in Nutrition & Dietetics from Acadia University, and a Masters in Exercise and Sport Science from the University of Sydney, Australia. Over the past several years Ashley has been working at the Canadian Sport Institute in Victoria, working closely with the National Men’s and Women’s Rugby 7’s team as well as with Triathlon Canada and within the National Mountain Bike program through Cycling Canada. Beyond the performance support she provides athletes, Ashley is dedicated to their short- and long-term health. While immersed in rugby, she took a keen interest in the role of nutrition on brain health and concussion recovery. She has developed post-concussion recovery protocols for both rugby players along with other high risk athletes. Ashley is currently involved in a research project alongside Texas Christian University examining the role of DHA in sub-concussion injury risk in elite men’s and women’s rugby players. Born in Vancouver, Canada, Sean Hayes was a competitive ski racer in his early teens. He brought his love of sports to the streets, where he picked up a skateboard and landed his first sponsor at 16. Sean traveled the world competing and doing demonstrations, as well being featured in many magazine interviews and cover shots. His keen interest in sports led him to enroll in the Sports Science program at Douglas College while recovering from a surgery. During this time he also took on the role Team Manager for DC Shoes (canada). An amazing opportunity was given to Sean when he was given the opportunity work for Plan B Skateboards, and he took his experience to California to manage the worlds most elite team of professional skateboarders. He worked with athletes such as Ryan Sheckler, Paul Rodriguez, Colin McKay and many more. His role expanded as he took more responsibilities, executing athlete, and brand marketing initiatives internationally. In 2010 Sean left his role as Team Manager to focus on his ever growing passion for high-performance coaching. Since then the athletes he’s worked with have won X-Games gold medals (Ryan Sheckler), Dew Tour Championships (Ryan Decenzo), and broke the Guinness World Record for the highest ollie (Aldrin Garcia). His experience with elite athletes, global marketing strategies, and a social media savvy complemented his transition into the literary world, where he wrote his first book Five Weeks in the Amazon, following a successful Kickstarter campaign. Sean can now be found spending his time between British Columbia and California, coaching Canada’s top professional skateboarders as they pursue their dreams to be the best skateboarders they can be. Breanne Watson is a former four-year letterwinner and four-year starter for the Washington Huskies…member of back-to-back NCAA Tournament teams as a junior and senior…ended her career with 861 career points, 492 rebounds…three-time Pac-10 All-Academic honorable mention selection…tallied 36 career double-figure scoring games which ties for 26th in UW history…named MVP of two regular season tournaments in her career – the 2004 WBCA BTI Classic and the 2006 Basketball Travelers Husky Classic…averaged 10.0 points in all NCAA tournament games played…represented Canada at two World University Games in Daegu, South Korea (2003) and Izmir, Turkey (2005)…upon graduation from Washington, Watson went on to have a successful professional basketball career in Europe. Currently, as Associate Athletic Director at Simon Fraser University, Breanne provides leadership to Canada’s only NCAA school. In this role Breanne oversees 30 full and part-time coaches, 17 varsity sports and 400+ student athletes – in addition to managing responsibilities for day to day operations, varsity budgets, event scheduling, presentation and team travel. Danelle holds a PhD in Social Psychology and an MA in Sport Psychology from The University of Ottawa, as well as BSc in Psychology and a BA in French from the University of Washington. For her doctorate, Danelle looked at how coaches and athletes communicate about training in endurance sport and how such communication affects athletes’ self-determined motivation. For over a decade, Danelle has worked as mental performance consultant with several national sport teams via the Canadian Sport Institute – Calgary, and currently through the Canadian Sport Institute – Pacific. Along with teaching sport psychology part-time at Camosun College, Danelle works collaboratively with parents, individual athletes, teams and coaches on mental preparation strategies for optimal performance and wellness in sport. As an athlete, Danelle grew up competing in soccer, basketball, volleyball, and track and field. She is a three-time Xterra World Championship Medalist, a former Professional Mountain Bike Racer and NCAA Division One Collegiate All-American in Track. During her off-road triathlon career Danelle competed for the Luna Pro Team between breaks to give birth to her now 10-year old daughter and 7-year old son. Competing into motherhood, Danelle has also been an advocate for mom’s to stay active and even competitive after having children. In her spare time, Danelle enjoys blogging on topics related to motherhood, sport and performance psychology at www.danellekabush.com. She currently resides in Victoria BC, Canada. Currently In her fourth year as the Canadian Sport School Victoria Lead Coach, Jennifer has a strong coaching background that involves working with athletes at various levels: Youth, NCAA, CIS, Professional, and Olympic including a NCAA and World Champion. She has a BA from the University of California at Berkeley where she double-majored in American Studies and French while competing in NCAA Division I Track & Field. Her passion is working with high school and young elite athletes to help give them a strong foundation for success at the next level. As a coach, Jennifer holds the following certifications: Strength & Conditioning (NSCA-CSCS), Olympic Weightlifting (NCCP & USAW), Sprints & Hurdles (NCCP), Run, Jump, Throw (NCCP), Fundamental Movement Skills (NCCP), Neurokinetic Therapy (Level 1), and Functional Movement Screen (FMS Levels 1 & 2). 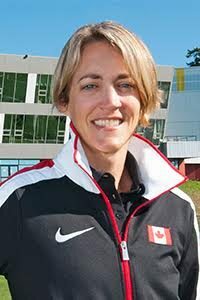 Having retired from competition in 2012, Jennifer has represented Canada internationally in the hammer throw and is the 2006 Commonwealth Games silver medallist, a four-time Canadian Champion, and a two-time World Championship team member (2005, 2009). Additionally, Jennifer is a two-time NCAA All-American (2000, 2003) and the former Canadian record holder. Jennifer brings a strong understanding of the high performance sport system and is very involved in athlete advocacy with experience serving on the IAAF Athlete Commission, Athletics Canada Board of Directors & Athlete Council, AthletesCAN Board of Directors, BC Athlete Voice Board of Directors, and Commonwealth Games Canada Athlete Council. Sharleen has been supporting elite and aspiring performers through her work as a mental performance consultant for 20 years. She earned a Bachelor of Science in Kinesiology from University of Waterloo and a Masters of Science in Applied Sport Psychology from University of Idaho before completing her Doctorate in Sport & Exercise Psychology from the University of British Columbia. Sharleen is a professional member of the Canadian Sport Psychology Association. Over the past six years Sharleen has been intimately involved with high performance sport through her work with national teams of cross country skiing, mountain biking (cross-country), rugby, swimming, triathlon and paratriathlon. She attended the 2014 Commonwealth Games and the 2015 Pan American Games, and supported athletes and coaches through three Olympic Games including the 2010 and 2014 Winter Olympic Games in Vancouver (Canada) and Sochi (Russia), respectively, and 2016 Summer Olympic Games in Rio de Janeiro (Brazil). Sharleen is an adjunct professor with the University of Lethbridge. She actively publishes her research on self-regulation and emotion management as well as sport talent development. Sharleen’s commitment to practical and scientific understanding of the psychological foundations of performance excellence affords a cutting edge approach towards training athletes, coaches, and sport performance staff to achieve personal and performance excellence. Ethan Carmichael Denum, 19, of Coquitlam, BC, passed away surrounded by family and friends on Saturday January 7, 2017, after a year-long battle with cancer. As a baby, he was eager to make an appearance and entered the world seven weeks early on January 29, 1997, at Royal Columbian Hospital. He had a short, but meaningful and accomplished life. If he wasn’t at the pool playing or refereeing water polo, he could be found travelling the world with his family, playing his favourite video games, eating or cooking in someone’s kitchen, or filling screens with an endless number of witty posts on social media. Perhaps his most notable accomplishment was the network of good friends he nurtured, many of whom the Denums consider family. We will miss his extra big hugs, fierce loyalty, positive attitude, and his unlimited capacity to love – this, above all, was his greatest gift. Hear from some of Canada’s most experienced and successful high performance athletes, and how they got to the top of their sport. This course features presentations from Olympic, Paralympic, and World Champion athletes covering everything from dealing with sport/life balance to competing at an Olympic Games. This course provides an overview of some of the most common mental barriers, and how athletes and coaches can power through them. Covered are concepts such as motivation, anxiety, stress, and consistency and include strategies for using each to an athlete’s advantage. This course teaches athletes and coaches the importance of recovery to the overall training program within high performance sport. The concept of recovery includes nutrition, rest (physical and mental), hydration, and sleep which are all presented in detail through the modules collected within the Applied Performance Recovery course. Securing financial support in most sports does not come easy. This course presents strategies and solutions for athletes to approach, connect, and close the deal with external organizations to help fund their athletic goals. Having a basic understanding of health in a high performance sport context is essential to athletic performance. The Sport Medicine course helps athletes stay fit and able to compete and train at their best by teaching athletes and coaches what they need to know to keep injury and illness at bay. This course offers a collection of modules introducing athletes and coaches to the principles of Strength & Conditioning (S&C). Beginning with an overview of developing a S&C program and how it is applied to a high performance sport context, the course narrows into specific concepts such as periodization and physical testing. SPSS Request: Life Services: You’re a High Performance Athlete… Now What? After spending 13 years as a competitive short track speed skater and seven years as a competitive soccer player, Natalie is no stranger to the world of high performance sport. In addition, she also has experience in the world of athlete career transitions. With a Master’s Degree in Athletic Counselling as well as several years of field and firsthand knowledge, Natalie brings a winning combination of personal passion and professional expertise to Game Plan. Natalie’s (non-sport) career highlights thus far include her time as an Academic Coordinator at Northeastern University in Boston, Massachusetts where she helped student-athletes develop and enhance the skills necessary for academic, athletic, and personal growth. On top of that, she was the Athletic Counsellor at Springfield College in Springfield, Massachusetts where she specialized in performance enhancement, goal setting, stress management, focus, and mental preparation. Building on those specialties, Natalie’s ‘Game Plan’ goal is to help educate athletes on the athletic performance benefits of career exploration while in sport. By encouraging a proactive approach to this crucial form of development, athletes working with Natalie have an opportunity to reduce outside distractions and concerns regarding ‘life after sport’ and experience an increase in confidence regarding transitions within and beyond sport. Melissa is a graduate of Mercyhurst University of Erie, Pennsylvania where she completed her Masters in Exercise Science and Athletic Therapy. While completing her Master’s, she led the Division I Mercyhurst University women’s ice hockey team throughout her four years. During her graduate studies she worked as an assistant athletic therapist for a variety of varsity teams at the University including: Division II Men’s Basketball, Women’s Field Hockey, and the Men’s and Women’s Rowing Crews. Following her studies, just over four years ago, Melissa began working at the Canadian Sport Institute as a Physiology Lab Coordinator where she has supported a number of provincial and national teams through field and lab based physiology testing. Shortly after joining the CSI physiology team, she was appointed as the lead physiologist for the Canadian Wheelchair Rugby program. She has supported the team at numerous international events over the past 4 years including, World Championships (Silver), Para-Pan Am Games (Gold) and the Rio Paralympic Games (4th). continuing to pursue these areas of research in para sport though the next quadrennial in preparation for Tokyo 2020. Rebecca graduated from the Bachelor of Nutrition and Dietetics program at Monsah University (Melbourne, AUS) in 2010, and following this successfully completed the Sports Dietitians Australia course in 2011. Rebecca is also a graduate of the International Olympic Committee Diploma of Sport Nutrition. Following her education, she completed a 2 year sports nutrition fellowship at the Australian Institute of Sport from 2014 to 2016, and it was after this that Rebecca brought her expertise to Canada. Rebecca relocated to Vancouver and began work with Canadian Sport Institute in the spring of 2016. She currently works with multiple summer and winter sport national team training groups and is part of a B2Ten’s national nutrition mentorship program. She is currently involved in a research study with Athletics Canada that will examine the impact of two different iron dosing protocols on the red blood cell responses of two groups of endurance athletes (track and field) during altitude training. SPSS Request: Nutrition: Caffeine for Sports Performance: Friend or Foe? Samantha is a Biomechanist holding a B.Sc. in Kinesiology and an M.Sc in Kinesiology specializing in biomechanics from McMaster University in Hamilton, Ontario. She has completed the Human Performance Training certificate from Sheridan College in Brampton, Ontario. Before moving to Vancouver, Samantha worked at McMaster University with varsity athletes as a strength & conditioning coach and student athletic therapist. Samantha is currently a Sport Biomechanist and the Performance Analysis Lead at Canadian Sport Institute Pacific. She is a member of the IST for the Canadian Freestyle Ski program, and provides support to other athletes based in the Vancouver and Whistler locations. Samantha has been a member of the Mission Staff’s Sport Science and Sport Medicine Team for the 2014 Commonwealth Games (Glasgow, UK), the 2015 Pan American Games (Toronto, ON) and the 2016 Rio Summer Olympics. This coming winter, Samantha will be supporting Team Canada as a mission staff member at the 2018 Peyongchang Winter Olympic Games. In this role she will be providing performance analysis support to mountain sports such as freestyle skiing and snowboard. SPSS Request: Physiology: Recovery - Why, When, How?